Lists can bring sanity to a chaotic household. My husband and I have learned that something as simple as a magnetic list on the fridge ensures we don’t return from the store only to realize we’ve forgotten to purchase several key items! Packing lists eliminate frustration with trip preparation. Meal planning lists make grocery shopping significantly more efficient. We also keep a list of household project ideas, so that with any down time, we simply pull out our list and determine which potential project would be best suited to our available time and supplies. Urgent tasks that must be completed by end of day. Important tasks to work on as time allows. 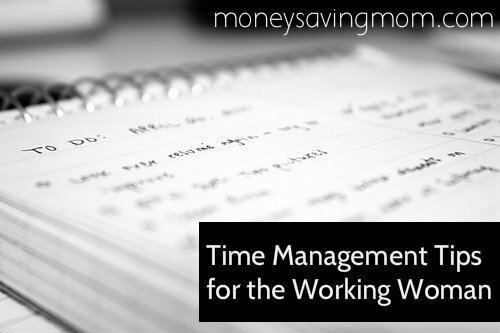 This ensures that my available time is always spent on the most urgent matters, and as time allows, I can easily knock out additional tasks that may be less time sensitive. In addition, as one item is completed, sorting tasks in this manner allows for immediate selection of the next task at hand. Always look for ways to be productive while you wait! If you let your dog outside each morning to do his business, use that time to pack your lunches for the day. While waiting for water to boil, you can empty the dishwasher. While on the phone, you can open mail, straighten your desk or fold a load of laundry. Take 10 to 15 minutes a day to tackle a single household chore — emptying trashcans, dusting, vacuuming the main rooms or cleaning a bathroom. This will keep the house tidy, without requiring an hour and a half of cleaning each weekend. Each night before bed I will plan our dinner for the next evening. This allows advanced planning if meat or other items must be thawed, and helps me identify any potential ingredients I may be missing and need to pick up on my way home the following day. In addition, this eliminates my biggest pet peeve — coming home from a long day of work, and trying to come up with a plan of what to make for dinner! Finding ways to make your chores more enjoyable will increase your chances of actually completing them! I now save all my ironing for the weekends, where my husband and I will put on a good movie, and I tackle the ironing as we watch. Procrastination is time management’s worst enemy. Take the bull by the horns and knock out the task at hands. Period! Sarah is a Regional Sales and Customer Service Manager at Simmons First Bank. She and her husband do not yet have children (although she’s confident that will take time management to a whole new level!). However, with demanding jobs and a number of volunteer commitments, their schedules are usually very busy, and require a significant amount of organization and effective time management. Looking for more? Read more posts about Time Management 101. I am really enjoying this series! I wish I would have read this article when I was a working woman with no kids. It’s great that you are are getting organized NOW-as opposed to what I did, which was fly by the seat of my pants until having kids, and then drowning. If you have a grocery delivery service around, set it up before you return from maternity leave. That means have a standard list established and in their system. That way, for the day/week/month that goes terribly wrong, you can log on to the web site and have groceries delivered the next evening or maybe even that night without having to haul tired little kids to the store during dinnertime in a snow storm while in heels while on a conference call. Always keep some cooked chopped chicken and a bag of frozen veggies in the freezer. I’ve heard people freeze rice. Even better. Stir Fry in 5 minutes or less. Cook in bulk. On Sundays in the summer, my husband will grill massive amount of chicken and veggies. Freeze leftovers. I make massive pots of soups and chilis. Keep meatballs in the freezer. Get the kids outfits laid out the night before too. As soon as they have the ability, encourage them to try to get dressed on their own. If you have any means to get some help with housework, by all means DO IT. No need to be a hero. Whether the 13 yr old next door folds laundry or you can hire someone to clean a bathroom. It all helps. Keep one calendar for work and home, that way you won’t double book yourself. (and lots of lists like the post mentioned). Stop buying things that need to be ironed immediately. Keep a hard schedule/routine in the morning to keep the kids on schedule. Do everything the same way every morning so they always know what is expected next. Save whatever they like the best for a job well done. For my kids, they love gummy vitamins. They get them after coats and shoes are on. Use your web sites wisely.. amazon, diapers.com, soap.com they can all be a lifesaver. This is fantastic! I’m a middle school teacher, and don’t usually know what time I’ll be home. I’m excited to use your “dinner after dessert” and “a chore a day” ideas! When I was working, I would stop home quickly before picking the kids up at daycare and get a head start on dinner, such as laying out the ingredients or turning on the oven. I would also take this time to change into comfortable clothes, which made me feel much more ready for the job ahead of me! I love this post today! I’m glad you acknowledge that some of us girls have to work and don’t have the luxury of staying at home. (and my dirty little secret: My kids sleep in the shirts they’ll wear the next day pajama pants). Divide and conquer in the morning. My husband goes into work after I do, and I take the kids. So while I throw on my clothes, he wakes up the kids and takes them to the bathroom, and puts on their pants, socks, and shoes. Then we put homemade waffles (frozen and toasted) with peanut butter in their hands to eat in the car on the way out the door. It’s a little messy, but it is so much easier to have them out of bed and into the car inside 10 minutes – there is no time for them to dawdle or fuss! I’m reading up on mindfulness as a practice and it’s helping me to let go of stressful thoughts and enjoy the moment more. How about sometime instead of multitasking, sit down and enjoy a cup of coffee or spend time with your kid. Working mothers have too many demands on themselves and it’s not ok that we can’t ever allow ourselves to relax and not think about work even when we are home and finally have a chance to read to our child or whatever else we’ve been wanting to do. I couldn’t have said it better……”working moms have too many demands on themselves”. I’ve been trying to remind myself that my kids will only be little once, and that it’s more important for me to spend time with them/read to them than try to get everything done. There really is no way we can get it all done anyway. I agree. Most of my days are spent trying to figure out how to cram one more thing into each hour of the day and I forget to make time to just relax and BREATHE. Thank you for this comment! I was about to say the same thing. I definitely take 30-45 minutes to rest and unwind before I start “round 2” of my day. If I don’t, I crash and burn. With 2 5-year-olds, being a full time student and working 32 hours a week, and hubby working 50+ hours a week and going to school 2/3 time, planning is so necessary at our house! Never mind that we certainly don’t have it mastered by any means! I second the meal planning, getting things laid out the night before, and doing a chore a day. My house isn’t spotless, but it’s clean enough I don’t panic when someone drops by and we have only been late to school once this year (by 5 minutes, because I forgot to check the traffic report! Opps! Note because of things at home. 🙂 ). Can I also add that having a back-up plan is necessary. I have my “plan” for meals and then I have my back up plan (cold cereal, bananas for breakfast; hot lunch tickets for school lunch or soup and sandwich stuff for home lunch; chicken nuggets, more soup and spaghetti for dinner). That means if things go hay-wire or we’re running late or something else comes up, I don’t have to run out at the last minute. I also have enough school uniforms and work outfits for 6 daysso if we don’t get laundry done in the middle of week (like I schedule) it’s not a disaster. And we keep a bit of extra cash handy so if one of us has an unexpected work lunch, or a field trip or birthday present to get we don’t have to scramble. Thanks for thinking of us working outside the home moms, Crystal! Ack! That should have been “not” instead of “note” near the first smiley face! Sorry! Great advice – in the post and in the comments! While the advice in this post is great and something we can all probably use, I see that it was written by a full-time work-outside-the-home woman who doesn’t yet have kids. Crystal, can we hope to see a post in the future from a full-time work-outside-the-home MOM???? p.s. thanks to the mom’s who commented with their advice. I always love to hear how other working mom’s do things. Always room for improvement!! I think it is coming up soon in the series….seems like i remember her taking requests for posts from all different situations. As a full time work outside the home mom, there are pieces of each post that are incredibly helpful and can help me customize my routine to fit my needs as a working mom with two little ones. Im looking forward to the future posts too :), but have enjoyed all the tips from everyone. Yes, the full-time working mom post is slated to run in a few weeks. 🙂 I thought it would be helpful to also have a post from a working woman who doesn’t have children yet, too. Oh goody, thanks. I thought I remembered you were looking for all kinds of different perspectives. I agree, I can learn something from all the women who have written posts, regardless of the similarities of our situations. I’m sure I can learn something new or get some new great tip from all the posts and comments too. Thanks again for a great series. and I hope that person has a long commute to boot!! I work an 8 hour day, but commute about 1-1.5 hours each way, each day. Leaves very limited time and lots of exhaustion. By the time the kids are fed and we eat, and baths and bed times are done hubby and I are exhausted! I don’t have energy to do 1/2 hour of cleaning!! And since we are not together during the week, the weekends are so precious, I hate wasting that time doing chores instead of being with my kids!! Just wanted to say there’s another one of us WOHWs reading here. I liked the chore ideas and meal planning. After dinner, I prepare lunches for the next morning, but I don’t always get to dinner. I have much more energy in the morning, so that’s when I get prepared for the day (i.e. 4:30am). I run through Breakfast, Lunch and Dinner – lay out Dh’s breakfast and vitamins and pack a piece of fruit for me, put packed lunches and water bottles in backpack/shoulder bag, and then start on dinner. Great tips! I have really enjoyed this series. 1) online deals – save me time and money and they have been giving away free money in the form of credits like crazy this year! I have been reading your blog for a little while now and I love, love, love this post! It’s pretty much how I live my life trying to figure in work and time with my little one. Firstly, I am a lover of lists- having written a post on that myself: . I am always multi-tasking and find that it’s the best way to get things done. However, I find that by the end of the day, there are hundreds of thoughts floating around in my head which sometimes makes it hard to fall asleep. I now keep a notepad and pen next to my bed. When all those thoughts start to keep me up, I jot them down so that I can really rest and recharge! i love this post! it’s similar to what i do as a working mom/blogger. i cannot function without my lists, and to simplify and streamline our lives we, in addition to our family’s variation on this list, also: pack lunches the night before, pick out clothes the night before, and practice teamwork. when chores become unmanageable, or there’s just too much for just one of use to do, we divide and conquer in order to get them all done. i’m blessed to have a husband that doesn’t mind helping with housework or going grocery shopping in a pinch! I just wanted to offer an unpaid endorsement for Cozi.com. It’s an online grocery list and to-do list that can be shared within a family and it’s free (ad supported). It syncs with an app on my iPhone and my husband’s Android phone – we paid for the app before the ad-supported free one was released. We can have multiple shopping lists (grocery, Costco, so forth) and multiple t0 do lists. It has a calendar and syncs with our online calendars (one way, so you have to either use their online calendar or make updates to your own.) I’m not quite as organized as I’d like to be but it’s helping out a lot.